I’m not going to lie – I’m a wuss. I’m afraid of my own shadow. I’m absolutely petrified of the dark. And I have a fantastic imagination. Mix all that together, and you have someone who slapped her best friend in utter fear when that friend decided to jump out from a dark corner and ‘surprise me’. So even though I bought Red Hill the day it came out, I waited almost 3 weeks to read it. Because it has zombies and I’m a wuss. 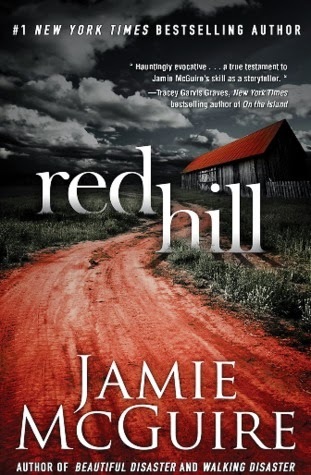 Leading up to the release of Red Hill, I noticed a lot of ‘ooh...it’s a zombie book’, to which the author more than once rebutted that it’s not about zombies, but so much more (this is purely paraphrasing, so don’t sue me if you think I’m mis-quoting Jamie McGuire). Holy mother of all teds! This is not a zombie book. This is a book set during a zombie apocalypse. The dead are walking; is that frightening? Yes. How they came to be? That scared the living beejesus out of me because it seemed so plausible. I’m not sure what kind of review this will turn out to be, but at the moment, the best I can do is pose this question to you: in the event of catastrophe, what would you do for the ones you love, whether it be your children, the love of your life, your siblings, your parents, or even complete strangers? This is what I was thinking about 20 pages in. And forget the fact for a moment that there are ‘shufflers’ taking over the world. I started to shake. I started to cry. I couldn’t imagine my life without the people I cherish the most. Yet this is the exact predicament that the three main characters find themselves in. Their stories are interwoven in a very intricate pattern that even skipping a few lines that you might deem inconsequential is not worth the nerve damage you will suffer later trying to piece the puzzle together. The story is told from 3 different points of view. Scarlett is looking for her daughters. Miranda is with the people she cares most about, but desperate to get them to her father’s place. Nathan has his daughter Zoe, but with everything that’s going on, has to be brave for her. There are so many crucial secondary characters that made this story an absolutely heartbreaking thriller for me. “We’ll be together, and we’ll wait for you” gutted me. My heart absolutely shredded for Ashley. And Andrew had me believing in redemption. This was not an easy read for me. This was beyond anything that I was expecting, and I feel quite ashamed that I waited 20 days to read it. This isn’t a story about zombies. I’m also not going to lie and say it isn’t a tiny bit scary, because it is (but this is coming from a scaredy-cat). But in the end it’s about the absolute need to protect the ones you love. Because in the end, that’s all that matters.